Back to a generals' republic? How popular is the Brotherhood? Three people, including a girl aged eight, died when gunmen on motorcycles opened fire on a wedding party outside a Coptic Christian church in Cairo. At least nine others were wounded in the attack in Giza, officials said. Egypt's Coptic Christian community has been targeted by some Islamists who accuse the Church of backing the army's overthrow of President Mohammed Morsi in July. 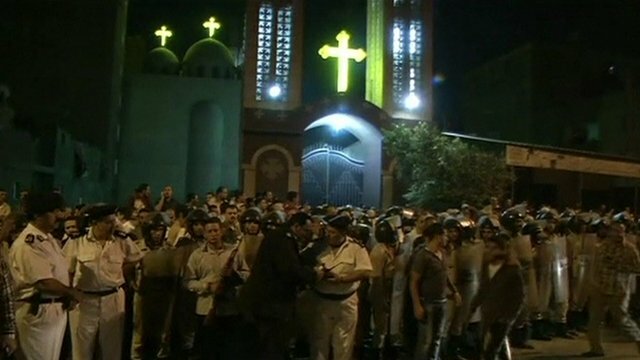 The unidentified attackers fired indiscriminately as people left the church. A man and a girl were killed outside the church and a woman died on her way to hospital. "We heard a very loud sound as if something was collapsing," one eyewitness said. "I found a woman seated in a chair with lots of bullet wounds, covered in blood. Many other people had fallen around her, including a child," he added. 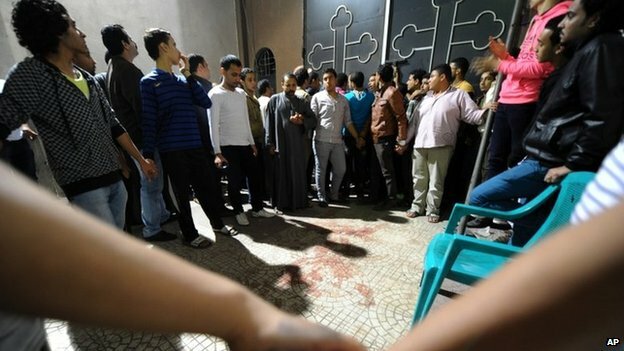 Coptic priest Thomas Daoud Ibrahim said he was inside the church when the gunfire erupted. "What happened is an insult to Egypt, and it's not only directed against Coptic Christians. We are destroying our own country," he said. Another priest, Beshay Lotfi, told Egyptian media that the church had been left without a police guard since the end of June. The Coptic Orthodox Church is one of Christianity's oldest, founded in Alexandria around 50 AD. Christians make up about 10% of Egypt's population of 80 million, and have generally coexisted peacefully with majority Sunni Muslims for centuries. However, the overthrow of Mr Morsi by the military has been followed by the worst attacks on churches and Christian properties in years. When head of the armed forces, Gen Abdul Fattah al-Sisi, went on television to announce that the Islamist president had been deposed in the wake of mass opposition protests demanding his resignation, Pope Tawadros II appeared alongside him. Pope Tawadros said that the "roadmap" mentioned by the general had been devised by honourable people, who had Egypt's best interests at heart. He has since received death threats, while several Christians have been killed. Christian shops, homes and businesses have also been targeted.